ChemMatrix® resin has been compared to polystyrene resin for the synthesis of many long and complex peptides and the results demonstrate that using ChemMatrix® resin will procure a higher crude peptide purity. This will also have the advantage of simplifying your purification steps. As peptides become longer, more complex or hydrophobic, using our totally PEG resin will significantly increase the final recovery yields. This will make the ChemMatrix® resin the best cost effective choice for your synthesis. 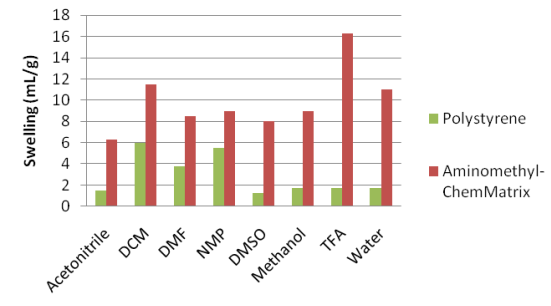 The standard loadings of commercial amphiphilic resins are mainly from 0,2 up to 0,3 mmol/g. With even a better amphiphilicity the Aminomethyl-ChemMatrix® has a loading of 0.6 to 0.7 mmol/g, which is up to 3 times the loadings of other PEG resins. ChemMatrix® resins are made exclusively of primary ether bounds which are very stable in all the synthesis conditions used in SPPS. The structure of the resin makes it well adapted to mechanical agitation. The beads will absorb the shocks and will not break even after a long period of mechanical agitation. This is a great advantage for large scale production as no smaller particles will be created which could block the filter. ChemMatrix® is a user friendly resin because it is delivered as a free flowing powder. It is easily weighted and transferred with minimum losses on glassware. ChemMatrix® allows the use of almost any kind of solvent, even water. The standard solvents used for polystyrene, such as dichloromethane and THF, are also compatible with ChemMatrix®. Some amphiphilic resins are known to have a good swelling, but the loading and/or the mechanical stability are affected. Usually, these resins become tacky and hard to handle once solvated. The ChemMatrix® is easily filtered and washed with almost any solvents.